Ever wonder what it would have been like to rent a starship? Here's what would have happened if you'd gotten your wish. We didn't make this picture. I downloaded this a while ago and can't remember where it came from. If you've seen this somewhere, let me know so I can give them credit. Would you have rented from Mr. Spock? 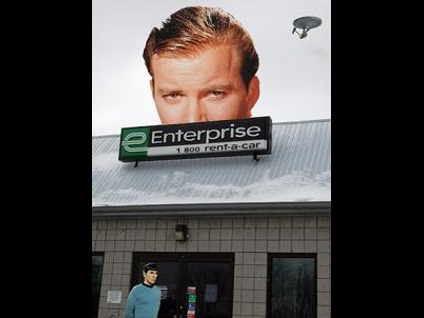 That's clearly fake - the addition of Captain Kirk's face on the billboard is a bad Photoshop job. But if it is, indeed, a real car rental shop, then be prepared since ideally these cars should travel way ahead -- in lightyears! Yeah,this method is very common now a days,as you know the who cannot afford the Limo especially middle class in in this action.So they hire luxury cars for the ceremonies.Nice work done on the blog,its very interesting and informative.However,if you want to track you car or to secure you car by knowing its Vin number so have a look on decode subaru vin. It helps you a lot. Nice to know about this rental company,actually due to the lack of money in many countries it seem like local to rent a car.Middle class people also needs rental cars.Nice work done on the blog,its very informative.However if you want to check the Vin of your car so have a look on decode subaru vin. Oh, please do not overpay for used cars. You may reduce the price in double, if you will find the defects when buying a car. To avoid deceive by the seller, check the VIN code of the car https://vincarhistory.com/license-plate-lookup/new-hampshire. Check car VIN will definitely save you from taking risky and unreasonable decisions when it comes to buying a used car. All the history from vehicle at one moment.